Set in New Orleans on the eve of World War II, Mischief and Malice is a brand new work from an iconic figure in young adult literature. Following the death of her Aunt Eveline, fourteen-year old Addie—who we first met in Berthe Amoss’s classic Secret Lives—is now living with her Aunt Toosie, Uncle Henry, and her longtime rival cousin, Sandra Lee. A new family has just moved into Addie’s former house, including a young girl who is just Addie’s age. Meanwhile, Louis, the father of Tom, Addie’s lifelong neighbor and best friend, suddenly returns after having disappeared when Tom was a baby. Between school dances, organizing a Christmas play, fretting about her hair, and a blossoming romance with Tom, Addie stumbles upon a mystery buried in the Great Catch All, an ancient giant armoire filled with heirlooms of her family’s past, which holds a devastating secret that could destroy Louis and Tom’s lives. 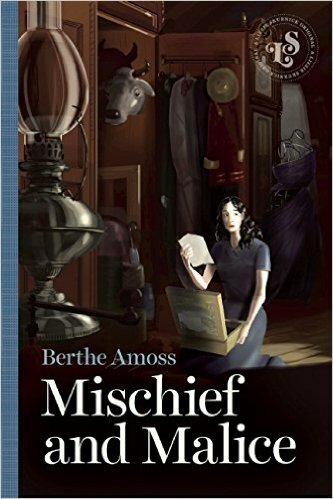 Once again, Berthe Amoss has created an indelible portrait of a young girl coming of age in prewar New Orleans.